I seem to have wandered into the world of microblogging (as in Facebook, Twitter etc) and neglected my beloved weblog, whoops. There are lots of things that I need to do, like respond to comments on the last post, write my epic ode to five years of blogging and much more, but I don't want to miss what is happening in the here and now, so I am writing this post. I will probably do a reflective new year post and include the thoughts on five years of blogging then. Lots of other things to update on too, like how the new business is going (The Doodologist) and all the many things I have learnt so far about striking out on your own. After Christmas I will be in doodle prototype mode, where I will be putting together some new ideas, which will be fun! As they will be my own projects that also means that I can do a lot more blogging about them, as they progress, without the worry of spoiling surprises etc. So I am most excited about that, as I love getting feedback and bouncing ideas off as many people as possible. In the meantime I decided to do some quirky Christmas gift ideas, as my commission work always whizzes off to its new doodle forever home, I never have anything to sell when I go to little events or to sell online via facebook etc and I am always thinking of new ideas, so it is most cool to see some of them come to life. 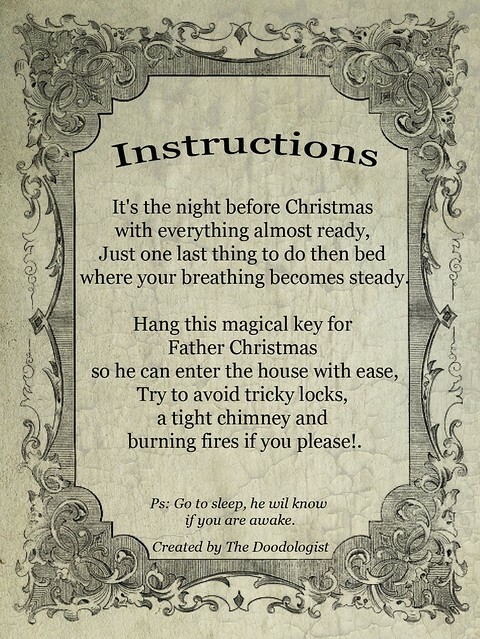 The instructions for how to use your Magic Key written on the image above, comes in a handy mini scroll format, please hang on your door knob of choice. It is probably a good idea to let the children decide, as they know best. 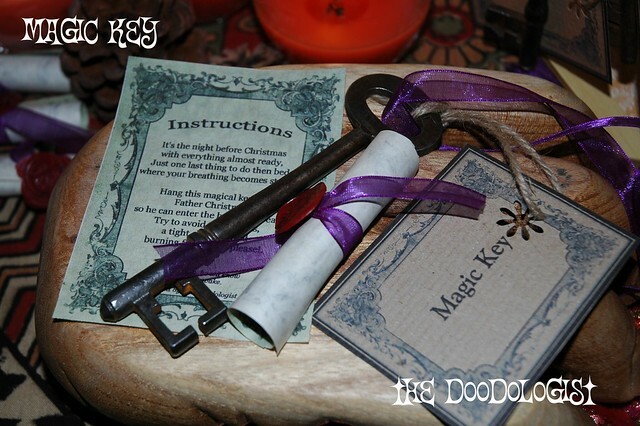 These instructions will be supplied in mini scroll form and will accompany your magic key in a lovely organza bag. Price is £5 for Magical Key, scroll and organza bag. 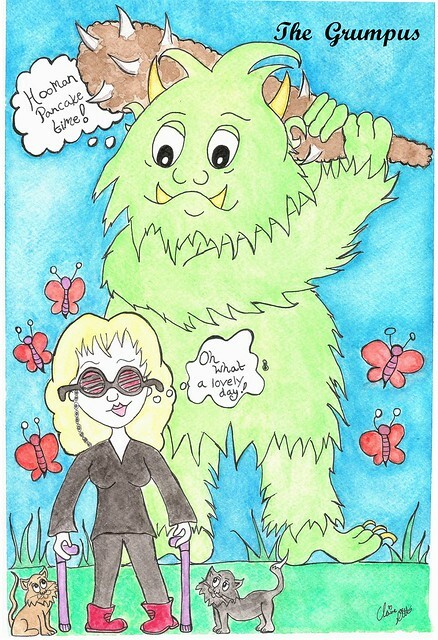 Hopefully I will have some time again to blog before Christmas, but if not, Happy Grumpus to you all. Hello! I'm happy to see a post again from you :D But I completely understand how easy it is to wander around FB & Twitter and forget about the blog. Twitter & FB are just so easy to get quick feedback from people. I absolutely LOVE the Magic Key gifts. I hope lots of people buy them! 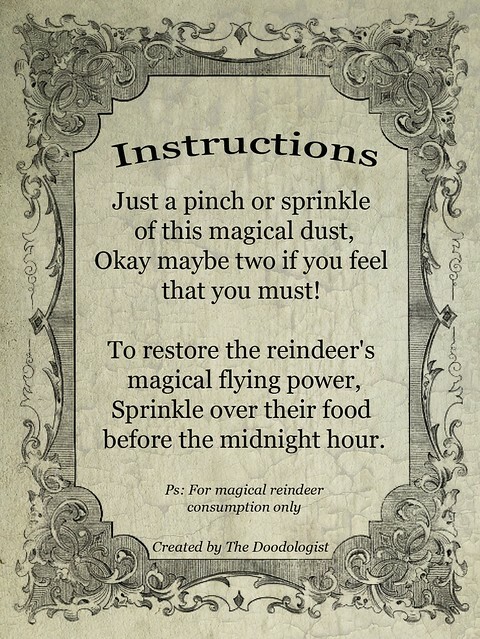 Love the instructions too! SO excited for you! Whoa ... an honest-to-goodness blog post! Not that I'm one to talk, mind you, as I have been a bit slack in my own blogging endeavours as of late. Ah, if only had a program where I could do my posts verbally whilst driving back from wherever it was that I just wandered off to! Of course it would need major editing but it would save me a lot of typing in the beginning plus it would make ensure that all of the cool stuff I just learned about was remembered correctly! 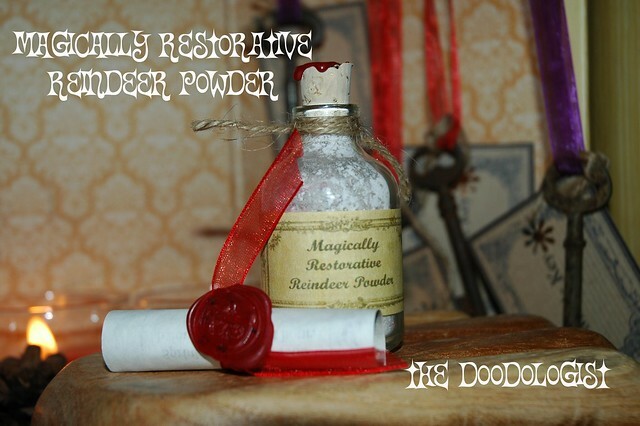 I simply adore the Magical Christmas Goodies above - I'm just not sure which I like better - the restorative reindeer power or the key for Father Christmas to get into the house without having to do that whole sliding down the chimney thing - perfect for homes without a chimney! You, my dear, are going to be going places with your business and I couldn't be happier for you! Three cheers to the Prince's Trust for seeing the potential in your hopes and dreams and talents! I just reread my post to make sure that I didn't spell anything wrong (I did) and I noticed that every single sentence ended with an exclamation point. That's probably not good grammar, is it? Guess it just goes to show how excited for you I truly am - grammar be damned! It's past Christmas Day and I have now just seen these awesome and cool things you made. Wow. You do have a clever mind and they turned out beautifully. Happy New Year! Marvelous ideas, Claire-so imaginative. I especially like the Magic Key. We could all use one of those. Wishing you the best of everything in the coming year. And I won't pretend I don't miss you at the forum. Hhaha merry (belated) christmas to you! Happy Christmas and Happy new year guys, things have been hectic, so delayed my response. @TJ, hopefully this is the start of my blogging a wee bit more frequently, but we shall see! I definitely want the space to write something more substanial than one does on twitter and FB, even though I like them both. The verbal post gadget would be great, if it arranged the post to accurate from a grammatical and punctuation point of view. Really enjoyed bouncing the ideas for the Christmas goodies, with your good self, it helped immensely! Equally looking forward to seeing you later on in the year. @Theresa, Thanks muchly, hope your Christmas was good and the new year is even better. @NP,I will always be here, but will never be going back there :) Hope to see you around the interwebs!